This outfit was inspired by Montreal and it’s Europeanness (is that even a word?). The key of this outfit and not freezing in it at about +15-18 Celsius is layering as always! Because I was also walking around Montreal for 15km a day, I had to be comfortable. This outfit is a perfect way to be so, yet it is still stylish. I paired dark wash jeans with a black shirt and threw on a patterned blazer – LOVE how it pops! Even though, the look is pretty monochrome, you don’t have to add color to make it interesting. In this case the blazer with geometric pattern does the trick – it is appealing to the eye and livens up the outfit. On my feet I chose to wear black New Balances. They are neutral color and shaped not too sporty – perfect for pairing with this outfit and still doing the job of being comfortable for walking a long time. It was quite windy in Montreal, so I ended up buying this hat at Club Monaco. 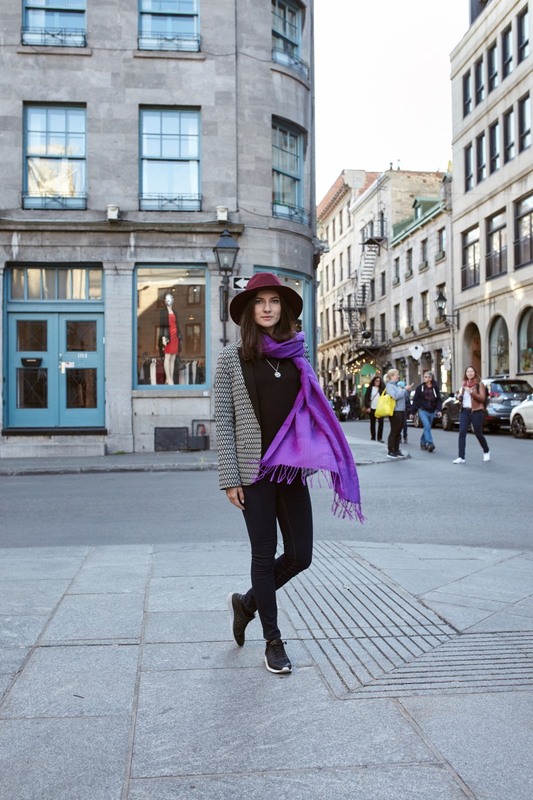 Together with my favorite purple scarf, they added necessary layers to keep me warm and… that European sass.